President Ahmed Mohamed Mahmoud (Silanyo) and members of his entourage came under intense grilling during a press conference held yesterday [13 February 2013] in London. This happened after members of Somaliland Diaspora in the UK demanded to know what were the polices and agenda set by Somaliland government for the upcoming London talks between Somaliland and Somalia which are due to be begin on the 3rd of May this year. The Somaliland Leader speaking at the press conference first thanked members of Somaliland Diaspora living in the UK for their unrelenting support in which he said “my deepest gratitude goes to the courageous people of Somaliland living in the UK for their undying devotion and patriotism to protect and advance the interest and the causes of this nation. 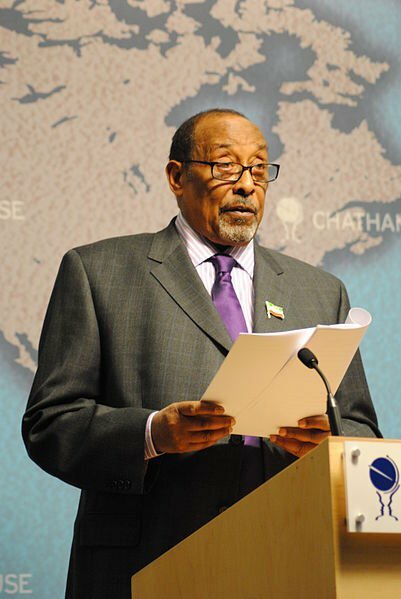 President Silanyo took the opportunity to once again reiterate his Government position on the upcoming talks which are to be held in London in May 2013 by saying, “ My Government position is clear on matters pertaining the upcoming talks which by the way is to find ways to foster close collaboration on issues of mutual interest with our neighbor as two distinct and different nations ‘which I believe is in our best interest, and does not diminish or damage our self-determination or sovereignty in anyway whatsoever. “We shall not accept any conditions which undermines, diminishes or goes against our much cherished will of self-determination and sovereignty’ anything short of this shall force us to cease all engagements in the upcoming talks, said President Silanyo. President Silanyo urged fellow Somaliland Politicians to abstain from activities that will hinder or damage the ongoing talks with Somalia and the principal agreements reached at the London meeting. Lastly President Silanyo touched briefly on the accomplishments made by government since coming to power 2 years ago mainly in the fields of education, health, Infrastructure and commerce among many others.